We believe if this guy was black belted he would have been the Grand Champion. Our goal is to lay in as much bone and heaviness of structure along with great feet and legs on our Exotic boars. Tough Mudder placed 2nd in class 5 this summer at the Summer Type Conference behind the Reserve Champion. He was undoubtedly the heaviest structured boar in the barn. Big Feet, Big Bones and super square from behind. Excellent rib shape with plenty of center body. Great top shape with a long and clean neck and head. Tough Mudder is very flat boned and extremely clean jointed. He is sired by the $225k Grand Champion Exotic boar at the 2017 World Pork Expo. This guy has a couple of black spots on his head. When bred to black exotic sows or black belted females, he will sire black, black belted, deep rich blues and spotted up pigs. When bred to white sows, he will sire white and very light blue pigs. He was the only white boar in the litter. There were several black belted, deep blue and spotted up littermates. Tough Mudder is out of a great brood sow and will leave some very productive, heavy structured crossbred females to put back in your herd. 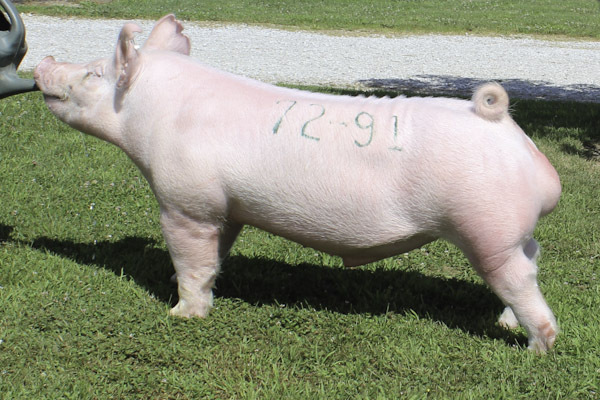 He is tailor made to make tremendous show pigs and win lots of hog shows. Littermate gilt sold for $5,700 in a baby pig sale and 2 littermate barrows have been cleaning up in the west.